If you are a Windows or Android user and are worried about the reports of phone carriers cracking down on tethering apps. 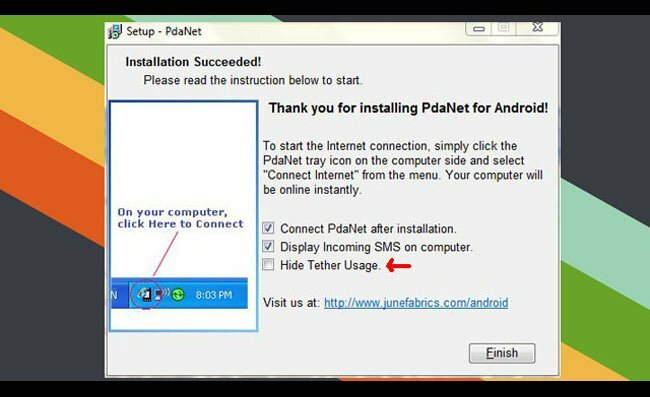 A new version of PdaNet 3.0 has been released which now includes a feature to ‘Hide Tether Usage’ from carriers. Mobile Carriers in the US have started cracking down on some tethering apps with carriers AT&T and T-Mobile blocking access to the applications from devices on their networks, and has been sending messages to unofficial tetherers. As well as supporting wired USB tethering PdaNet 3.0 also supports Bluetooth DUN tethers, and incorporates a SMS agent from which you can receive and respond to text messages from the computer that’s tethered to your phone. The new PdaNet 3.0 software is already available for Windows and Android and a Mac version is expected shortly. You can download PdaNet 3.0 for Windows x86 | x64 | Mac | Android and more information is available at the developers website. Take a look and our article on Android vs iPhone to see which smartphone and mobile platform is best for you.